This is for my fellow steemians... Trying to make it here on Steemit. Your own experience is the best teacher and the more you do the more experiences you’ll have. Do something!!!! This is for my fellow steemians... Trying to make it here on Steemit. Your own experience is the best teacher and the more you do the more experiences you’ll have. Do something!!! I agree with our friend, experience they say is absolutely the best teacher since it actually prepared us for the future, though we should always look toward positive experience. When I first joined steemit on February I had zero knowledge on how it take to be successful on this platform but with commitment, consistency and determination I'm getting over it gradually and I'm making a desirable progress. Me too, but together, we can all be leaders. sir really steemit job my most choice man @nathanmars, sir I am resteemit and upvot done your post. Congrats for the success on steemit. And success doesn't mean earning money or geting ups but to make good friends here on steemit and keeping their trust on you. I joined on MARCH and took some wrong path but now i regrat it and again started the journey for a good means. Uhm, we all make mistakes but learning from it has been the best thing to do, I'm happy you really learn to move forward. Yes bro now will really work hard on it. experience they say is absolutely the best teacher since it actually prepared us for the future,though we should always look toward positive experience.shadow is nothing else but it only follows you if you tell it to do something it won't unless you do!! My experience has been my teacher in life and I learn fast cause I hate to make the same mistake again..
Thanks,I pledge to be a good citizen here in my country and a good Steemians. Thanks so much sir really steemit job my most choice man @nathanmars, sir I am resteemit and upvot done your post. Sir @nathanmars Love Your Proposal Well Explained..
#We Love Sir @nathanmars. and respect you sir. of course sir, @nathanmars. That's because people like you are here.That's why steem is going forward..and thank you so much sir.. Yes sir @nathanmars.And till we die, we will do good work for the steem & you will be respected and loved sir @nathanmars.. The success on Steemit is very interesting since every second in the Steemit world you can do a selfless action for somebody else. You can practice selflessness. And the biggest success is those small actions that you do and the upvotes coming in when you are busy doing other stuff. Compound growth is very powerful. Just as you say experiences are king. Because it gives you so much feedback in return that your results in the future will be better since you will become more sharper. It's a big trend these days to hold yourself back. I guess this happens a lot because people consider how others will perceive them in this new world where everyone is watching. And also as you say just do anything and you are already ahead of the masses since already that is a massive thing. As of 2018 we now have this platform where we everyday for the rest of our life can practice daily giving to others. We need ideas in this world how we can change 1 billion peoples life. Since the access to capital becoming easier since investors are looking for great ideas to bet on. I'm already working on my second bank loan to pump that into Cryptocurrencies since I know when I believe in something that go all in is the way I want to live since I trust my own intuition. Do massive work and then promote it with all you got. Once your work is solid nobody can say nothing. When we do less work we try to do small desperate acts of work. What is a better strategy is to find a mode where you are in a constant flow by doing micro actions of doing all the time. Something living on YouTube for 5 years have learned me is outbuy everyone in combination with hard and smart work is a sure strategy to work. Whoever gets seen the more wins. Since our Time and Attention is the real currency in this world. I want to give you 200% upvote because you sound true entrepreneur. Good luck with your bank loan! I really think we need more people like yourself go all in on Steem. I can tell you one thing that lots people are underestimating the potential of social media/network. For me Steem is the new Bitcoin and we’re all early adaptors and Bitcoin miners. Yes you are right. People really do underestimate it. It's a really new concept of someone paying you to do regular content. That someone would pay you 75 dollars to upload a regular vlog wasn't in someone's head 2015. But it works since the value of building up quality relationships via quality communication is worth so much more than the short term value that we give away. I have done some deeper calculations that our focused Time is worth around 25 dollars per minute in the modern age. Because of access to the Internet and the ability to reach billions of humans. That will say it all becomes about faster be able to make more connections in the network. In the future I bet we will have thousands of transactions going in and out for each human per day. I truly believe most Steemians who is going to make it here are people like your self. It’s my pleasure @melissakellie!! We’re all here to add value to other people’s life with our own super power! Yes certainly agree! Traveling was real education in my life and nothing can come closer. Happy to hear @smartbcamp! Let’s do good things to others via steemit and become Steem millionaires to help more good Steem citizens! To be wise you do not need to read a thousand books you need to live, think and experience. Reading book is so 1970.. lol There is no substitute for experience! There is Everything one can learn from his surrounds and if he continues doing so he shall garner experience which in the long run would cater to him in different situations. I am a big of mahatma gandhi he is from my country India. Btw did I forget to mention how fascinated am by your posts . I am telling you sir you have got some serious writing skills You are inspiring many. Be proud of who you’re not where you from. I’m a global citizen and world is my country and I hope one day we can live in a world with no country, no borders and most importantly no war. i try to motivate my self and other to keep working in steemit. it's a good place actually, but if someone do not find the suit way for himself he/she will not feel pleasure. that's in my writing i encourage people to be themself in order to find a comfort place where they should be. sometime people try to be other and finally they get stuck on midway of their Journey in steemit. For me steemit is a home, a work place and i find myself comfort in writing. so i do writing. I’ll check your steemit blog to see what you’ve written. thank you for coming to my blog. i appreciate so much. you so kind. A very good post @nathanmars, your words can always be a very good motivation for all, and especially for those who just joined in Steemit. Your words are short, but they all have profound meaning. Experience is the best teacher for us, because from experience we can know what our shortcomings, so that's where we can change ourselves to be better. In my opinion, in this life we ​​must have a principle, and a strong stand, otherwise everything we do will not get a satisfactory result, and most importantly, we must be able to change the way of thinking from day to day, we must can change today should be better than yesterday and so on. That way, there will be many things we can change. I think you are suitable to be an advisor. What is your opinion? Do you agree? Thank you so muck for your kind words @reynakarina!! I can only advise myself, as I only know what best for me from own experiences. I agreed with you and Gandhi, We need faith but the faith needs to be accompanied with work, hard work and effort to make things happens. We are the change! Thanks for agreeing with me and Gandhi. @nathanmars, I agree with you, do something there must be lessons and experiences. I keep following you, may best be with all of us. @nathanmars, best regards from me, where do you live? Thanks! I’m global citizen and I move places to places. Today I’m living and enjoying life in Japan. Japan is a country I like because there is a snow season, I live in Indonesia. I’m happy to hear you like Japan and I love Indonesia and I’ve only been to Bali and Lombok and I’ll be going to other islands in Indonesia very soon. @nathanmars, Have you ever been to Sabang, this is a beautiful island too, if you go to Indonesia please tell me, hope you continue to succeed in steemit, sorry my English is not good. Yeah that is it. You must have to start to gain anything. 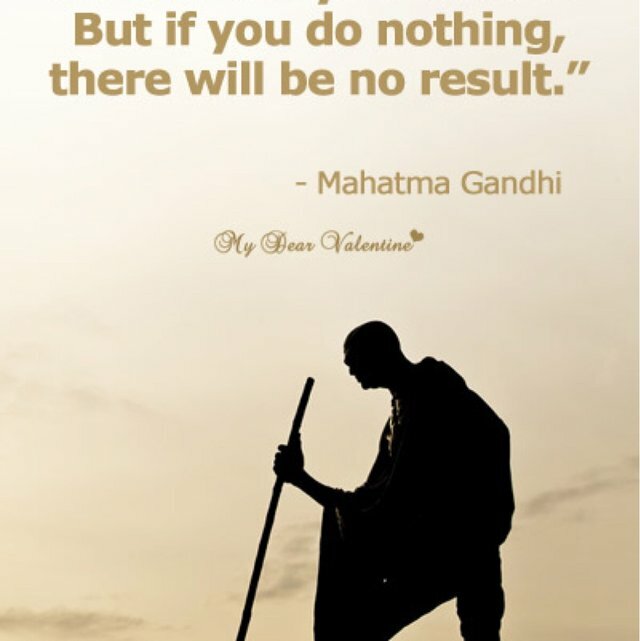 If you just think and do nothing, how can you expect any result?? Thank you for the inspiration! Yes if you want result, you must put in the hours. Hey Nathan, how's it going? Of course having a huge chunk of Steem Power sure helps, but at it's most basic element, Steemit is just like any other social media community and you achieve success here by doing the same things. These being post quality content, post consistently and engage with your readers. The recipe for success is actually quite simple when you write it out like that. I know you said you don't use Discord when I asked you the other day, but I'd still like to chat to you about some Stuff around your Steemit blog. Do you have a Twitter account or even an email address that I could get in contact with you through? Thanks for your response and advice @forexbrokr! I’ve a big heart, which want to help many people and spread positive energy in Steemit world. I’ve deep desire to help good people and I figure the fu..ck out how to do it... I’m so rich not because of some formula but because of my core principles are inline with the universe’s intentions and universe give every tool, I ever want. PS.. I’ve used probably every single social media in the past and now I’m all in Steemit, So chances are near zero that I’ll check any of my messages anywhere apart from Steem based platform. Haha that's an interesting way of looking at things. Sounds like me and you have same core beliefs. Life is short and let’s live life in our way and that itself is a rich life! The more time you spend here the more you learn and the more people you connect. We spend more time focu I always say time is going to pass whether you choose to be productive or lazy. And it's your choice on how you wanna use up that time. Very motivating. I always say time is going to pass whether you choose to be productive or lazy. And it's your choice on how you wanna use up that time. Very motivating. Time is doing its job well and it’s keep moving forward and most humans are thinking backwards. Life struggles sometimes be a gateway for a persons life success and that it can be a method that could pushed someone to pursue and dedicate itself just to grab those target success. ok,bro @nathanmars thanks for your kindness and importnat comment. Those who do not know how to use it properly, they can not lead life in the right way. Sorry for this, but I think differently, for the current internet technology, I think to grow on steemit, friends, relationships, and a solid community are always available. Take the time to get back and get love from each other and I also look forward to learning some of your experiences on developing blogs on steemit. Thank you for the study, thank you friend. I also like the difference, but it is important that the difference be meaningful or valuable to the community. do the best that you can with what you have got, the way you know how. Yes 100 % agree. First of be greatful for what you already have then Focus all your energy in doing your best and everything will work out fine.. I really appreciate those people who struggles enough even the hardest path just to reach the goal he/she wants to become. They should be recognized and honored for the efforts that they do in any way. Thank you so much for your contribution @ellianaa! Let’s make Steem great and beneficial for more people around the world! If you suspect Bitcoin could be a risky place to invest your money in 2018, I just want you to know, you’re right. I can only give my opinion. EOS and ADA have good longterm potential apart from STEEM. Also ZEN and BCH could be good investment too! Yeah sir ,experience is the best teacher and if we want to gain experience we must need more and more practice.,self defence is the best defence. I don't agree with self defence is the best defence. If you can stand on your own feet without others support then you don't need to defend at all. Negativity never brings positivity. Thanks for the uplifting and motivational words my friend . Make you're a good millionaire with good intention... Okay ?? this steemit job my most you like @nathanmars , and you very a great man. We all have dreams. But in order to make dreams come into reality, it takes an awful lot of determination, dedication, self-discipline, and effort. I hope he makes his own path here on steemit, best of luck for his journey on steemit. Tell him on my behalf Experience is the teacher of all things. Hope he achieves something here. Hello, I'm a trader, I always bring the community a good deal of information about the cryptographic market, I see you say good. "Your own experience is the best teacher and the more you do the more experiences you’ll have. " Yes, I learned a lot from the step, I considered that as a source of additional information, but instead I was not paid attention to the community despite the content I posted on my blog. It is very valuable. Sorry @sonpham I don’t like traders. I truly believe there way so many fu..king crypto traders out there and they don’t really provide anything valuable for the community. If you really trying to meet your ends meet, I’m okay with that. I hope you find something within crypto community other than trading.. Yes, thanks, but my goal is to become a pro trader to get those money to help those in need, and become a well-known businessman, and I'm also trying to get on with my goals. I set out. I’m so happy to hear you’ve good intentions and the universe will give you all the tools you needed to help those in need ! Thanks so much, I'm still trying to do that, and looking forward to the support from the community so that I have the best motivation for development. Yh!, of cause it's true... When nothing is been done, there can't be any result. Because there is a saying that goes like this "for every action there is always a reaction". So doing something is the action, while the result is the reaction. So therefore, no action, no reaction. Thank you. Thanks for agreeing with me @k-banti. Back when I joined Steemit January this year , I had no knowledge whatsoever but as I interact with the platform, got flagged and downvoted. I learnt a lot and that had contributed to my journey so far . I thinks it's good to join steemit without much prior knowledge and learn everything by experiments with positive attitude. Yeah experiment is what I learn from, positive attitude in my is my watch word . because the best teacher is the experience, many tell you what they have achieved on the platform and it serves as inspiration but what one lives and feels in the bones is what really educates you here. The ability to learn things by yourself take you far. To the moon!!!! If we have dreams we must fight for it, because we will not get something if not doing anything. This is what is called experience, what we have been through and it is the best teacher to get to the future. I believe that a bright future will be achieved by learning from mistakes that are life experiences .. Experience teaches me many things, especially in living life and it will be a provision for me .. But most of us do not believe in our own ability to prefer to depend on others. Steam is a place! From where we can change ourselves! Steam is (...wonderful and peaceful...) place! From where we can change ourselves! Yes my friend. Experience makes a persons better in any field. Doesn't matter how much you know about something but if you lack expericence then you can do nothing. I'm trying to do something , working hard on it and improvising myself from the lession i learnt in the past. Thanks for sharing your thought @punkblogs. Welcome friend. Just trying to understand the up and down that life gives us. The objective must be to work and have experiences; So that when we talk about Steemit we have anecdotes and we can laugh about the way we have traveled in Steemit. and enjoying everything you have achieved. Greetings friend! Informative post , thank you . Nice photo shoot . Keep good work . Determination and Teamwork ! We can do it, by doing something ! Thanks you for your contribution and I'm glad to be your friend @andrina! Am just new in this grate community and l need word of encouragement to go forword. Thanks for this post. Hi brother am @ewawumi am new here l can l grow fast to help oncome fellow steemit and please l will not forget the person that bring me here to enjoy this grate noble community my lovely sister @yetunde please as need help. You must earn your support and trust! That’s the only way to succeed in Steemit. I'm all in on Steem-based social media/networking platform. Thanks for encourage us so that will not give up in steemit my leader ,l can call you my leader you not discourage us .thanks foe that MAY GOD BLESS YOU. Thanks for this post. God will be with you. Thank you and have a wonderful day ! success is hardly measured since there is no particular indicator or metric guide which can help you determine the height if we can consider it a success or not. Some people just inform other people on their success and their struggles in life on how they obtain it's triumph. Are you crazy enough ??? I hope you're !